We spent the first few days in Lima, under cloudy skies even though the Internet said sunny!! We had a great tour of the city and ate in some wonderful restaurants...one we are recommending to everyone we meet is La Gloria...the waiter there was the best...ordering for us. And of course Pisco Sours everywhere, all the time!!! On August 25th we flew out of Lima to Cusco (Leigh birthday) as we landed the whole world became really different for me. It was like having several quick shots of alcohol. The altitude was 3200 meters so multiple by 3 to get it in feet. Kurt says we live at 700 meters. The air is thin so you are to walk slow and breathe deep!!!! 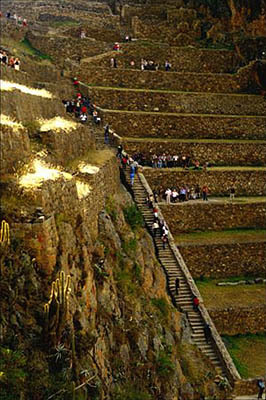 We had a walking tour of Cusco that day and saw all the Inka foundations that the Spaniards build their homes on top of. The streets are narrow and every where you see the traditional Inka people selling there crafts and treasures. The hotel we are staying in is called the Monastery, which pipes church music throughout the place the rooms are awesome, they even provide oxygen, so I'm inhaling from the ceiling!!!. We left Cusco by a twelve seater plane, called picso airlines like the drink!! !into the jungle on August 26. The best part was having me weighed before you got on the plane and having a cute 10 year girl called Emily from London England telling everyone who was within hearing distance how much you weighed. We were weighed with our hand luggage!! !so we had an excuse, why we gained weight from all the wonderful food we have been consuming. We landed after flying over Inka ruins and temples and the Andes mountains into the jungle and landed on a grass mud air strip!!!! A man came running out with a wheelbarrow to take our luggage!!! Then into the jungle on a motorized canoe for a 1 1/2 hour boat ride down the river to the Manu Life Centre. We arrived to be greeted by four pairs of scarlet macaws and two pairs of Blue and gold Macaws in the trees just over our cabin. We were told to drop our net at night and tuck it under our mattress why I will tell you later!!! We took our first walk into the jungle and climbed a canopy tree (144 stairs Betty Anne I counted) for an overview of the jungle and sunset. Meaning we walked back to our cabins in the dark with flash lights. Seeing our first tarantula with her six babies...cute not!! But huge!! When we got back to the cabin we had many visitors....cockroaches... the first night 6, then 10 and the third night 18 then the word got out we were serial killers and no one came the last night!!! Thus the reason for tucking your net under your mattress cause I let one in the first night. The camp site heard about it!!! We saw Tapirs at a clay lick one night then a tamed Tapir called Vanessa came to the camp. I was there petting her and feeding her bananas they make the cutest noises. She just had a baby!!!! We went to the clay lick for macaws and I think we saw at one time about 160 macaws. Coming and going. We have great video shots. I came out of the jungle with 54 sand fly bites they apparently have no issue with DEET. Kurt came out with a powerful right swing killing cockroaches!!! We came back to Cusco on August 30 and continue our tour on the many places the Inkas held the worship sites. We arrived in the Sacred Valley, which was a large agricultural site for the Inkas. We toured the Pisac Ruins and had a three course lunch at the Hacienda Huayoccari. Then vising the Ollantoytambo Fortress with a minimum of 350 stairs, of course!!. There are mountains all around us because we are in the valley and the views are amazing. One mountain which we took pictures of is called Veronika, after my mom. The people are very colourful in their dress. They have baby alpacas and lambs and want you to take their picture. Cusco people love dogs so there are dogs everywhere. Well feed but some need a bath and a cuddle!!!! I'm going to start a business washing dogs or maybe just taking them home!! The weather is warm almost hot during the day and sunny and quite cool in the evening. We have been staying in some of the most amazing hotels. They are on the orient express hotels list and are breath taking. We left the Sacred Valley on September 1 on a train ride for one and half hours to Machu Picchu. The trip was quite interesting for me. I apparently had eaten something or it was the altitude but managed to pass out on the train then proceeded to throw up for about half hour, ending the train ride with me tossing my cookies into a trash can in the train station like the drunks do!!!! !Needless to say I missed the cliff hanging drive up top Machu Picchu and spent the first day in a beautiful suite overlooking the Inka city. By 7:30 I was over whatever attacked me and asked Kurt if he could bring me something to eat when he returned from dinner. Arriving on a huge silver tray was my supper...opening it to my surprise was a piece of toast, a banana and a cup of clear tea....just what I asked for three hours earlier . So you really need to be careful what you ask for because you get just that!! I was up a going at 5:00 the next morning to see the sunrise from the Guard Tower, but snuck into the dining room to get some food first!! I cannot start to describe this site you have to come here and see it. It is breathtaking and beautiful, mystical and spiritual and yet very advanced. The Spanish never found this place so it was not destroyed as everything else was the Spanish touched. We have amazing pictures. When we were waiting for the sun to rise, the fog would roll through over the city. At one point Marco said it was like having the money run out on the telescope and you see nothing. I thought that was a perfect description...as I was walking down I heard a couple saying that the fog was really thick. I told them to put a quarter in the telescope and it would be clear in a few minutes..they laughed. We returned to Cusco on Saturday by train and spend today Sunday, exploring the salt pans and the Moray archaeological site. We had the rare opportunity to visit a place where the women are teaching the young women how to weave the traditional way with the wool from sheep and alpacas and dye the wool and spin. It's amazing!!! So we are off to get ready for supper in the main square. And we are catching the 10 hour train to Puno tomorrow morning. Sorry this was long but there was no power in the jungle. So was showering and going to the bathroom with flash lights to fend off the creatures of the night. The latest from Peru On September 4th we had an early transfer to the Orient-Express Andean Explorer, first class coach complete with three course lunch and fashion show and bar car!! When I say early I think I can actually say that I have been up before 5:00 am seven or eight times on this vacation!!!! The train ride was 10 hours long and spectacular. 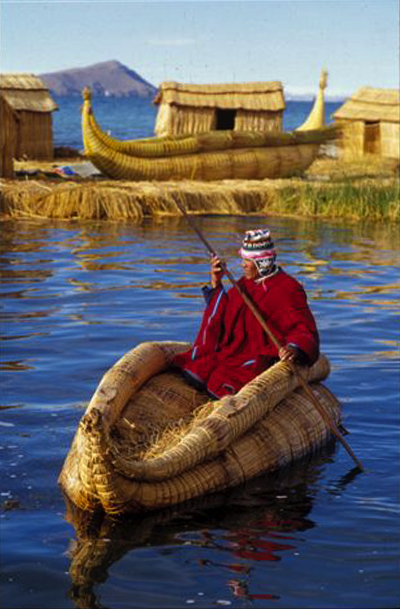 It starts in Cuzco and runs south to the historic city of Puno, which is very poor, on the shores of Lake Titicaca. We had a gentle climb first half of the journey through the Andean mountains, towering over the deep valleys of the meandering Huatanay River. Then the gentler, rolling Andean Plains, where vicuña and alpaca were. I bringing one home (alpaca) or adopting one when we get home they are so cute!! The train moved at about 50 km and came to abrupt stops many times!! Not sure if it was a cow or a person!! We stopped at La Raya, the highest point on the route. Talk about space cadet!!!! We went through one town where the people built their businesses around the rail track. If you opened your window you could touch them. We went through town at 5km in the train. It was neat. When we got into the station there was a gate that closed behind us for security!! On September 5 we sailed in our private yacht around the Island of the Uros, which are floating Islands made of the reeds in the Lake Titicaca. The people have to add a layer of straw every two weeks to keep the island afloat. I cannot image what it would be like during rainy season!! We then sailed on to the Island of Taquille where we climbed the easy way!!!!! I thought I was going to die on a path with cows, bulls and sheep and alpacas! It was very steep and the altitude is 12,550 feet so you get winded quickly. This island has been farmed since 4000BC and the people still wear the traditional clothing. The clothes Betty Anne you would love they are colourful and bright!! We then came down the other side of the island down 582 stairs!! I counted, Kurt almost lost it!! We had lunch at a private guest house at Llachon, and our guide Edwardo who also supplied wine!! made the King fish dish. It was yummy. Then we were escorted by two friendly puppies to the dock, down hill of course, one had a potato in his mouth!! Kurt's question is why do they need to build everything so high up. I'll tell you this trip is not for someone who cannot climb I think we have hiked over 50 km and climbed over 3000 stairs!! to date and more to come. Because of a strike situation at Copacabana between the people and the Franciscans priests over the rights of tourism we decided to take a vacation day from our vacation so we hanging around the hotel today. Not drinking much, having some difficult with the altitude, dry skin, shortness of breathe and headaches. Having a shower as Kurt said this morning was an ordeal. So we spent the afternoon in the steam room and hot tub watching a group of alpacas munch on the grass. We began with an early morning drive to Sillustani, as we were walking up this path our guide that during rainy season when the water runs down this path it undercover bones of bodies. Then he stopped and pointed out what could have been a knee or elbow...that was when he suggested a short cut climbing straight up I think it was a ploy to get us to walk this way!!! The place had a really spiritually about it, knowing that there were still people buried in the ground and untouched. We then drove to the Great Temple of Pukara, which was a sunken temple. On the way along the highway dogs position themselves, when I asked why Edwardo said that when the buses go by the people if they are eating will throw out bones and the dogs know to wait. So we fed them bread, slowed down honked the horn and they caught the bread in the air!! 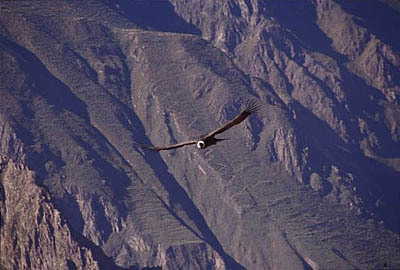 Tomorrow we are off on more adventures and flying to Arequipa and the Colca Valley where we hope to see the condors!! and lower altitude!! Stay safe, talk with you soon again. Monika with Kurt who is reading. We stayed in the quaint place of the trip last night called the Parador del Colca, we had the famous water bottles in our beds and Marco got scared again thinking this time it was a guinea pig!!! The man who runs the place Cesar, was very attentive and let us feed his baby alpacas at 4:30pm, he had five and needed help..Giselle and I were there!! The property has been sold to Orient Express and they are expanding and building new cabins which we got a tour of, wow!! hot tubs outside in every room and even outside showers!!! We drove to see the condors soar in what is a canyon twice a high as the Grand Canyon. At one time our driver pulled over to the side so we could get our Kodak moment and I thought Kurt was going to jump into my lap...so we could tumble into the valley in each others arms. I think he realized he has a uncomfortableness with heights!! We saw Condors probably the same four over and over again but they were amazing. Wing spans of over 13 feet. Got some awesome videos. We then stopped to climb up to see the Mollepunko Caves which are some 500 years old and had paintings in the caves. It was a good trek and very windy. When we got to the top I thought it was going to be deep caves so I had my Jungle flashlight with me only to find out the caves were maybe 50 feet deep. I quickly hid my trusty flashlight so no one saw. The next day we explored the canyon...some of the roads were pretty narrow!!! !and steep!!! Went to the hot springs after lunch it was great we were there about one hour before the crowds of 50 arrived. Nice timing very relaxing!! Back to Arequipa via the express route...we needed another vacation day from our vacation. Got into town at noon...had lunch and off shopping...we bought up all our gifts and had a drink in a terrace over looking the main square as the sun was setting. Then we had dinner at a place called Zig Zag, sitting in their balcony window overlooking the street, where we hadt the trilogy...alpaca, beef and ostrich served on a hot rock!! The following day our last we toured Arequipa and the outskirts of the town. Kurt actually had a vicunas spit at him...too funny!! Wished I had captured it on video but I was laughing too hard!! We caught a flight to Lima and had a few hours to relax in a Jacuzzi and have dinner before heading to the airport for our 2:30 am flight. It was a nice way to end the vacation. Great friends and a wonderful time with lots of stories and pictures to share when we see you all at home. We should be back by noon on September 12th. Looking for dinner??? Maybe!!! I think the frig is probably void of vegetables and fruit! !